Mexican Restaurant Caboo in Chatan aims to become the newest trendsetter among local restaurants, according to restaurant manager Toyomi Takushi. The 28-year old speaks with conviction of someone who took a chance and gave up a dull but safe career as an “office lady” in a big company, and switched to a much less secure but challenging job of managing a Mexican-style restaurant a year ago. It was a big change for Takushi. She says, “I love cooking, so I thought this was a good chance for me to try something I really wanted to do, a chance of my lifetime.” She said that her experience in Mexican foods was pretty much limited to tacos, but added quickly that she had always been eager to try to cook new foods at home. 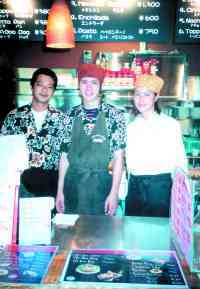 Takushi said that she grew up behind Charley’s Tacos restaurant in Chuo Park Avenue in Okinawa City. She especially remembers the smells that wafted from the shop. “I noticed that the smell of their tacos was a little different every day. I could almost tell by the smell whether the cook was having a good or bad day,” Takushi laughs. Her hometown, Koza cannot be talked without talking about tacos. “Years back, almost every restaurant here served tacos. American service members came and bought them for snacks, and we learned to eat them too,” she says. Besides tacos, she recommends the Mexican Omelet Rice, and Caboo Lunch Set, which is a mixed plate that includes tacos, pasta and fried rice with drink. 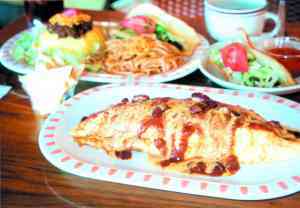 The Mexican Omelet Rice comes with a special bean sauce that is Takushi’s own recipe. Other popular dishes include goya (bitter melon) pasta and goya fried rice. Customers are also tempted to sit down outside on the terrace where they can enjoy the gentle breeze in the evenings and nights. Caboo is located on the first floor of Carnival Park Mihama building. The Ferris wheel on the top of the building is a good landmark. There is plenty of free parking in the area. The restaurant entrance is facing outside, next to the outdoor stairs leading to the second floor. Their phone number is 098-926-4333.